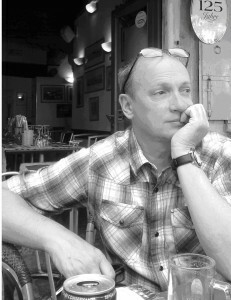 If you read my previous blog, you may remember that I’m a quantity surveyor and project manager. Watching programmes like Grand Designs I am struck by the lack of references to cost control on construction projects - perhaps had a quantity surveyor been appointed costs may have been contained within the original budget. However, this is no simple task especially when dealing with the refurbishment of a building dating back to the 1700s, as with my current project. 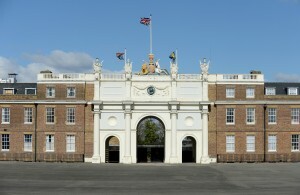 I'm dealing with some specialist historic works at the Royal Artillery Barracks in Woolwich. 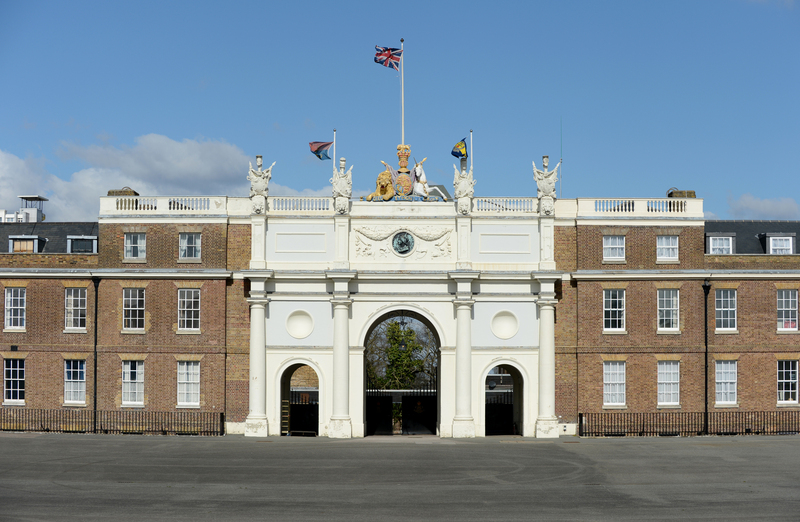 We are refurbishing and providing 45 Junior Officer and 12 Senior Officer single living rooms in the Grade 2* listed Officers’ Mess. Building on my extensive background in the commercial management of projects I am forever striving to forecast the costs as we demolish various parts of the building and discover asbestos or works which do not meet current building standards. This sort of thing necessitates remedial works which inevitably result in additional costs. Endeavouring to balance the original budget against the works already completed and provide a realistic estimate of future works is an arduous task. This is particularly the case where we removed the roof coverings and discovered extensive damage caused by water ingress. 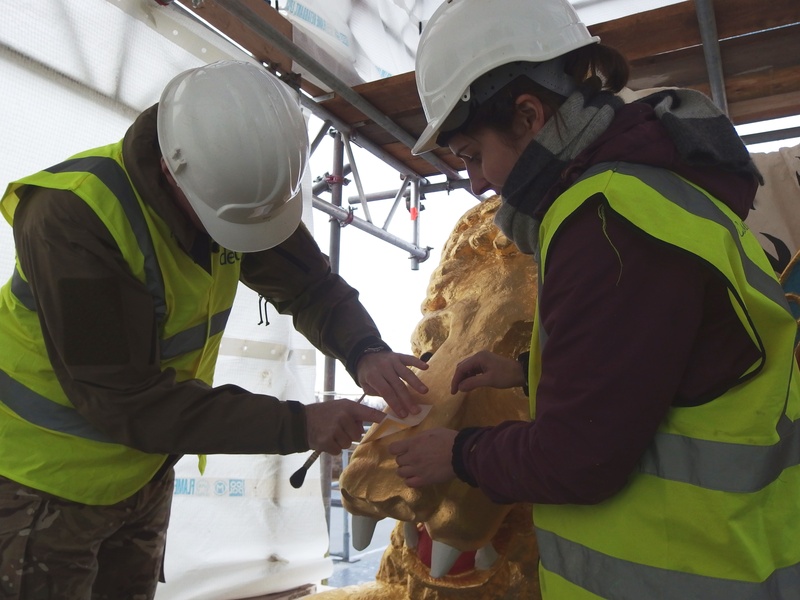 Thankfully on the 17th November we marked the completion of the roof repair works with a topping out ceremony, when Major General EA Smyth-Osbourne CBE placed the last piece of gold leaf on the nose of the lion which is part of the Coat of Arms located above the central arch. These figures have been located in this position for over 200 years and were carved out of a piece of Portland stone. Whilst remedial works had taken place over the years, the decorators, Campbell Smith & Co, had a formidable task undertaking investigations to establish the correct colour of the items. For example, the cloak had acquired a mauve shade but has now been restored to ermine. 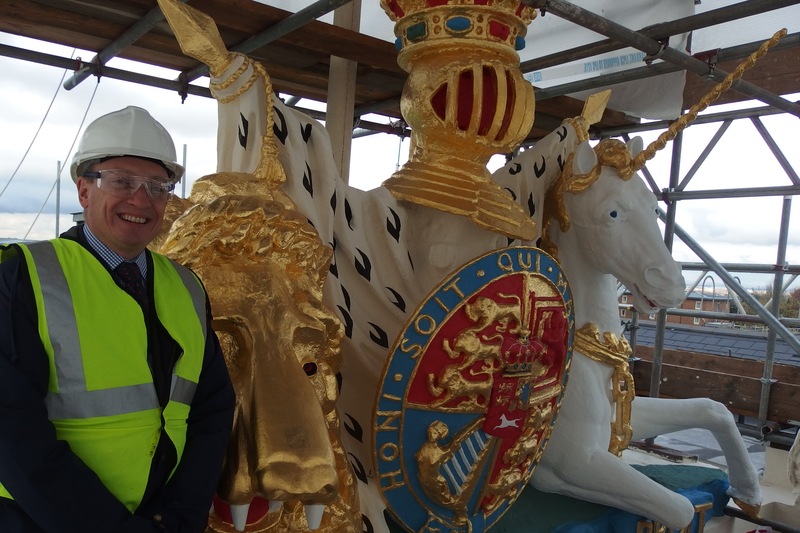 In the public areas, which were out with the scope of the project, I am faced with the decision on remedial works necessary to the ornate ceilings in the public areas of the Officers’ Mess, in particular in the dining room. The ceiling in this area has extensive cracks, the majority of which result from previous works; our problem is to decide how far to take the renovation works. 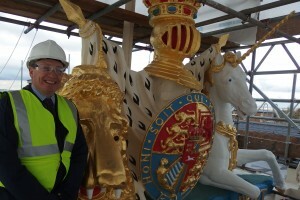 In addition I am faced with the decision of whether to replace the balls which adorn the heads of some of the coat of arms, which have been damaged. The team, lead by our contractor Debut Services Ltd, are undertaking a survey to establish if the ceiling has moved during our works when the roof was removed. When this is complete we will develop a strategy to make good these areas, taking account the budget we have for these works. Considering this part of the building “contains the best surviving barracks interiors from its period within one of the finest examples of military architecture in the country” there is a difficult task obtaining a balance between expenditure and ensuring we do not exceed the original budget - ah, such is the life of the quantity surveyor!